Gin is a type of alcoholic drink with a high amount of alcohol in it, usually about 35-50% alcohol by volume. It was invented in the Netherlands in the 17th century, and soon became very popular in England. This became a problem when many people drank themselves to death, because gin was cheap to make and contained so much alcohol. Gin is flavored with juniper berries. Today, gin is usually a dry liquor, which means that it is not very sweet. 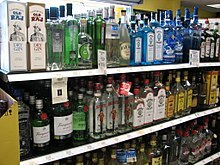 Gin is also very popular in cocktails - two of the most common of these are the Gin & Tonic (gin mixed with tonic water) and the martini (gin mixed with vermouth, usually with an olive added). Gin is still one of the most popular liquors to this day. This page was last changed on 21 May 2013, at 16:27.